Benedict's No. 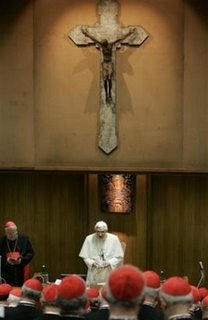 2, Cardinal Angelo Sodano, opened the meeting by thanking the pope for seeking the advice of the cardinals, saying it "shows us the importance your Holiness places on the votes of our college." The daylong session came on the eve of Benedict's first ceremony to elevate 15 prelates to the top tier of the Catholic hierarchy — additions the pope has said reflect the global reach of the church. The agenda of Thursday's meeting appeared to be fairly open. Cardinals have said they expect the discussion to include relations with Islam and the Orthodox Church, international terrorism and the reform of the Vatican hierarchy.